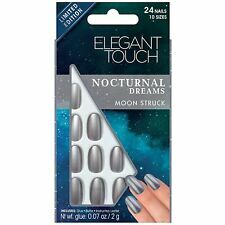 Elegant Touch False Nails - Nocturnal Dreams Moon Struck (24 Nails). For ping-proof nails, this all-in-one manicure kit has you covered! With 24 nails in 10 universal sizes, you can have pretty, perfect nails in minutes. Squoval False Nails. squoval shape nail size guide. Bling Art Squoval Shape: These are square shaped nails but with rounded edges, creating a natural sophisticated almost tailored look. It is the most flattering false nail shape and is probably why it is our most popular. 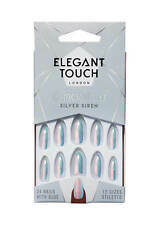 Chrome 2.0 Silver Siren Stiletto - 24 Nails - 10 Sizes - Glue This all-in-one manicure kit gives you pretty, perfect, ping-proof nails in minutes! Elegant Touch Nocturnal Dreams (Moon Struck). 24 nails, 10 sizes and glue included. Condition is New. (24pcs Artificial Nails. 12pcs Artificial Nails. 24pcs 3D Nails. 12pcs 3D Nails. 24pcs Diamond Nails. 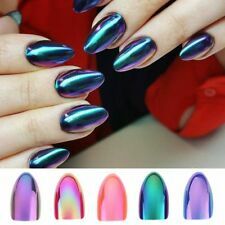 These nails are full cover nailFOR Adult. False nail (adult) False nail (adult) False nail (adult) False nail adult) False nail (adult) False nail (adult). 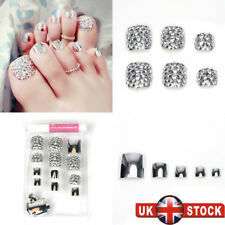 Bohem Pair Sterling Silver False Nails, Gothic, New/Gift, RRP £24.99!